Ronaldinho, one of the game’s greatest ever players, has become the latest star signing for the tenth anniversary of Soccer Aid. The Brazilian legend will form part of 2015/2016 Premier League winning manager Claudio Ranieri’s Rest of the World squad as they take on Jose Mourinho and Sam Allardyce’s England. The two star-studded teams will once again go head to head in what promises to be another electrifying match on Sunday 5th June, broadcast live on ITV from Manchester United's legendary Old Trafford Stadium, all in aid of UNICEF, the world’s leading children’s organisation. He joins the Rest of the World squad which includes his fellow former Brazilian teammate Cafu, Manchester United favourites Jaap Stam and Dimitar Berbatov, Dutch midfield dynamo Edgar Davids, former Barcelona and Cameroon international striker Samuel Eto’o plus Germany and Arsenal goalkeeper Jens Lehmann – who will all be looking to make it two Soccer Aid wins in a row for Rest of the World. The ex-Barcelona and PSG player will go head to head with the England Legends: Liverpool icons Jamie Carragher and Robbie Fowler and former Manchester United star Phil Neville; David Seaman and his former Arsenal team-mate Sol Campbell. In the commentary box will be broadcasting icons Clive Tyldesley and Chris Kamara with Howard Webb officiating in the middle. 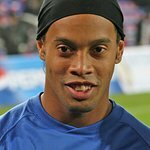 Ronaldinho will be playing alongside the previously confirmed England and Rest of the World celebrities who include; One Direction's Louis Tomlinson, pop star Olly Murs, TV and Heart FM presenter Mark Wright, pop star and presenter Marvin Humes; comedians Paddy McGuinness, Jack Whitehall and John Bishop, Jonathan Wilkes and GMB’s Ben Shephard with TV and Heart FM presenter Jamie Theakston in goal. Unicef UK Ambassador and Soccer Aid creator Robbie Williams is Assistant Manager with Bradley Walsh, once again on hand as the morale boosting coach. The Rest of the World Legends join Captain and Unicef UK Ambassador Michael Sheen, Michelin-starred Chef Gordon Ramsay, pop star and presenter Nicky Byrne plus Kiss FM and ITV’s Bang on the Money presenter Rickie Haywood-Williams. Niall Horan from One Direction has been named as Claudio Ranieri’s Assistant Manager. The tenth anniversary match promises to be bigger, better and bolder than ever before, as the world’s biggest stars from sport, music, television and film play in an action-packed game to raise money and vital support for Unicef’s work for children in danger. The money raised through profits from ticket sales will add to the incredible £17 million that has already been raised for Unicef to help provide children with life-saving food, vaccines, and clean water, as well as protecting them from violence, exploitation and abuse. 100% of all public donations will go towards supporting the vital work of Unicef. The biennial live event will be hosted by Soccer Aid veteran Dermot O'Leary with TV presenter Kirsty Gallacher once again pitch side to report on all the action as it happens. This will be the sixth Soccer Aid event, with previous matches held at Wembley in 2008 and at Old Trafford in 2006, 2010, 2012 and 2014.